Enormous Thanks Go To Elise Engelberg & Bill Foss! We’re ever so grateful to Elise Engelberg (of The Mercury Dimes) for all the time and talent she put in to help us Stairwell Sisters out while Steph has been gone. We enjoyed playing with her so much and were amazed at how quickly she learned everything (and how fast she could play those tunes). We look forward to playing with her again in Colorado in June for a little tour that Steph can’t make. Of course, we are sure looking forward to the return of Steph around April 20th!! Before her return we have one more tour – to the midwest (Chicago & Michigan) where we’ll have the honor of playing with yet another amazing fiddler, Bill Foss!! Please send your friends and family out there our way. And we sure look forward to meeting all our new friends that we’ve made on MySpace! 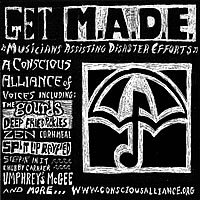 We’re proud to be part of a new compilation CD dedicated to assisting hurricane disaster efforts – Musicians Assisting Disaster Efforts, A Conscious Alliance of Voices, Vol. 1. In addition to the Sisters, the CD’s roster includes The Gourds (who wrote a special song about hurricane Katrina just for this CD), Split Lip Rayfield, Umphrey’s McGee, Hit and Run Bluegrass, Chubby Carrier and the Bayou Swamp Band, Jefferson Hamer w/Ben Kauffman from Yonder Mountain String Band, Zen, Kathryn Keats w/Darol Anger, Cornmeal, Steppin’ In It, Toni Brown Band, the Tallboys, plus a few “surprise bands” and the Deep Fried Pickle Project. Limited Edition CD of “the finest Americana Musicians” with a $20 donation. Check out the details here! For more information on how you can help, go to www.consciousalliance.org or www.pickleproject.com. Keith Terry Beat Our Socks Off!